One market veteran might say "buy the dip." Another strongly advises: "Sell!" Yet another knowingly smiles and comments: "Volatility is normal, just ride it out." However, in EWI's four decades of analyzing the market itself, as opposed to news and events that are usually seen as market drivers, we've observed that recognizable and repetitive price patterns show up in the DJIA's price line at all degrees of trend. That's what makes the stock market predictable. The primary value of the Wave Principle is that it provides a context for market analysis. This context provides both a basis for disciplined thinking and a perspective on the market's general position and outlook. At times, its accuracy in identifying, and even anticipating, changes in direction is almost unbelievable. That's right, an analyst who is familiar with these repetitive price patterns, as well as other technical analysis methods and sentiment indicators, can anticipate stock market trend changes with a high degree of confidence. Indeed, the next day after the DJIA's Jan. 26 all-time closing high of 26,616, EWI's Short Term Update signaled to subscribers that the market's advance was toast. How? The Short Term Update editor, Steve Hochberg, labeled the end of the price line with fifth waves at two degrees of trend. 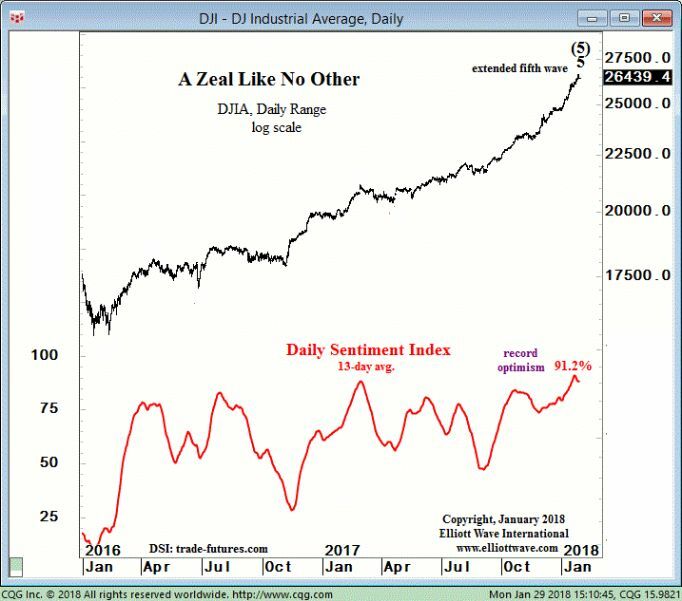 It was just last week that the Daily Sentiment Index (trade-futures.com) on S&P futures jumped to 96% and the 13-day average pushed to 91.2%, an all-time record... At the same time, the 30-day average of the NYSE Trading Index is .88, a seven-year overbought extreme. But, here's what's remarkable: Our Short Term Update not only called the sell-off, but also prepared subscribers for the DJIA's sharp rebound that followed. A new video by EWI's Robert Folsom titled The U.S. Stock Market: From "Zeal" to "Change of Character." shows you how. This highly instructive video is available to you now -- 100% FREE. THAT's what the Elliott wave model can do for you. See the evidence of just how useful the Elliott wave model can be, during extreme stock market volatility. Watch the just-produced, highly instructive video by EWI's Robert Folsom, titled The U.S. Stock Market: From "Zeal" to "Change of Character." This article was syndicated by Elliott Wave International and was originally published under the headline How to Anticipate Stock Market Trend Changes. EWI is the world's largest market forecasting firm. Its staff of full-time analysts led by Chartered Market Technician Robert Prechter provides 24-hour-a-day market analysis to institutional and private investors around the world.